Enjoy the maximum of opportunities and save your time! It is the most modern way to invite guests to your wedding! Are you ready to make your wedding modern and interesting? Do you want to turn the process of inviting guests into an exciting pastime? Then our service is created exclusively for you! Place your own love story, program of events, and also tags on the map. Connect the Instagram stream with your own hash-tag - photos from the instagram will be displayed on your page! Each guest will receive an individual invitation and will be able to confirm participation in the celebration, sending you a couple of words and answering the questions you are interested in. Interactive invitation is your unique story-appeal to guests, which is created almost instantly! An invitation is always available on the phone or on the guest's computer! Such an invitation is especially convenient for the guests who are kilometers away from you, and for those who, for some reason, still have not seen your soul mate. The functions of the service are constantly improving, so be sure that you are using the most perfect one! Our service is equipped with all the necessary functions to work with the invitation! No payment BEFORE is required! Just a few moments, and the invitation is ready! Use the full functionality of the service to the maximum! Mark the place of the ceremony and the restaurant on the map and make the schedule of the day – it will be easier for your guests to navigate. Delivery online and via SMS + statistics! Ask your guests questions,that you would like to have answered. Answer the possible questions of the guests in advance! Each invitation is personal, with the possibility of confirmation. Your photos from Instagram are displayed on your page. Add a video appeal to your guests to your invitation! Your invitation will work on your own domain name! At the moment, there are 4 high-quality interactive invitations, adapted for any device! Service #wedinvent or site "DIY"? Take a couple of minutes of your time and watch the comparison of opportunities of wedinvent.ru and the prospect of creating a wedding site by yourself, "DIY"
You need to select and pay for the domain. A third-party domain is not required. It is included in the price. You need to pay for hosting services. Working with us, you will not have to hear this terrible word hosting :) It is included in the price. You need to buy a template for the site. The cost of the templates has already been taken into account. You need to optimize the content on your own, or to be engaged in forwarding all information to the selected contractor. You are free from any coordinations! Fill in just a few fields and manage the photos by yourself! You can not send personal invitations for each guest. Personal appeal to the guest! You can send personal invitations by SMS or via text messengers. You will not be able to connect the Instagram stream with your hash tag. Our service has been tested and approved by Instagram! Connecting your hash tag occurs in just a couple of clicks. If you need to change the marks on the map, the schedule of the day or other data, you will have to contact the contractor again and again. You will be able to change any posted information by yourself at any time! We thank all users for the nice words! Many thanks for your service !!! We saved a lot of time in the matter of inviting guests! Every step was quick and efficient! We recommend the service to our friends! :) Dont hesitate - just try it! It s awesome! Happy that we have found such a thing! It is really something new and interesting! It is especially useful for the guests who live in other cities. They have appreciated the benefits of such an invitation! Nobody asked the questions like: "And where? And when? ", well, except those ones, who did not look through the invitation ;) Good luck with the development of the service! First and foremost, we want to thank the lightning-fast support! We have got the help in a second! Thank you for adding the ability to embed a video message - this is a very useful thing) And thank you for helping us to place it in our invitation! People in love try to make every single moment spent together magical and unforgettable. And that is why the most important moment in their lives - the wedding celebration - should be turned into the most charming, amazing and overwhelming action ever. However, it requires a huge investment of forces and costs for its preparation and implementation. Do you want to make your celebration unique, and turn the routine of the traditional invitation of guests into a fascinating process? Then you need a special wedding site, which acts as a trendy wedding invitation. The wedding site is an indispensable attribute of a modern wedding celebration, that allows you to introduce your soul mate to your guests and relatives and facilitate the process of organizing the celebration. Here you can find the necessary information regarding the future event: from the countdown timer to the touching personal photo archive of your love story. The wedding site provides a detailed schedule of the celebration, indicating the exact time and places. This information is supplemented by a detailed map of the journey to the venue of each stage of the celebration. By creating your wedding website, you can choose the design you like from the offered templates, you can use personal photos and videos. Each person invited by you will receive a personal invitation to the wedding and will be able to confirm his or her presence. This is especially useful when your guests are from other cities, regions and countries. 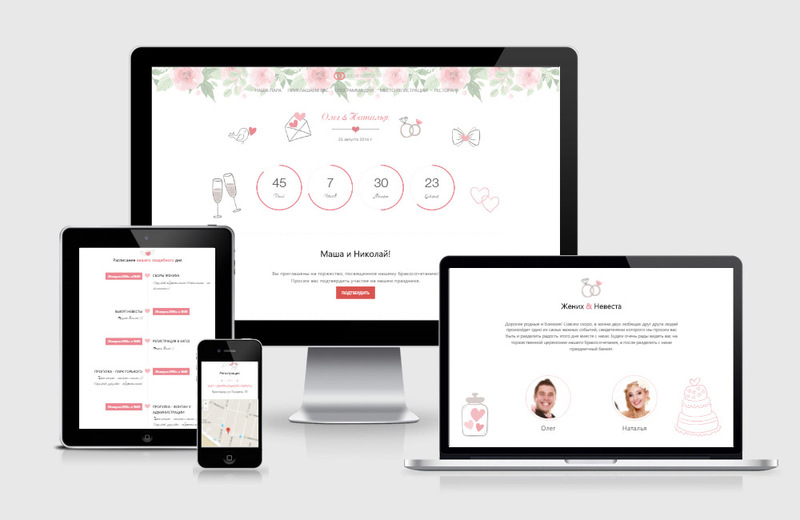 An interactive wedding invitation is created for your comfort and is available not only on any computer device, but also on mobile gadgets. The information posted on your wedding website can be viewed only by the people you want to see at your celebration. Then you can put wedding photos on the site, which will be definitely viewed with pleasure not only by the newlyweds, but also by the guests. impress the guests with your originality and creativity, sharing with them the happiest moment of your life. After the solemn event, the wedding site can be transformed into your personal family photo album, from which the story of your happy family can begin. The site with the invitation to the wedding is a modern and incredibly creative variant of the invitation to the celebration, which will appeal not only to the newlyweds, but also to the older generation.It can become an original, up-to-date and desired gift for the wedding celebration of close friends. What happens to the invitation after the wedding day? Answer: The invitation is available within 1 year after the wedding! You will be able to upload the wedding photos so that all guests will be able to have a look at them, and you will not have to send them to each guest separately. Answer: You do not need to if you do not want to! :) The Service easily allows you to use the invitation as an invitation site with absolutely the same functionality! Will the invitation work on mobile phones? Answer: Yes, of course! The invitation works well on smartphones and tablets! The Service is adapted for mobile platforms. Is it possible to select a new invitation template when the payment has been already done? Answer: Yes, it is! You can change the chosen template at any time as well as select a new one. Do you provide any help if something is not clear by the drawing up? Answer: Of course, we do! If you have any questions please feel free to contact us. Sign in through social networks in 1 click! I will make my invitation!